Best Madness Predictor? If you went with the Breitbart Sports published brackets for each region you are a strong 12-4, but if you simply took the team with the best Value Add player in each game you are definitely winning your bracket at 14-2. The best bracket predictor on the opening day of March Madness? The team with the top Value Add player on the court went an incredible 14-2, including RJ Hunter leading Georgia State to a shocker over Baylor. Hunter was projected as a preseason All-American by Value Add projections covered by Fox Sports at the campaign’s outset, and at 34th in the current database. Expert analysts who tend to value offense over defense expected upsets by Stephen F. Austin and Eastern Washington in Oregon against Utah and Georgetown. Value Add noted the superior defense of the Utah team (lead by No. 1 Value Add player Delon Wright) and the Georgetown team led by D’Vauntes Smith-Rivera (ranked 10th). The two Top 10 Value Add players shut down the high-powered offenses to get wins. Butler and UCLA were also underdogs according to Vegas, but won with the best Value Add player on the court. Butler’s Kameron Woods was ranked ahead of all Texas players, and tied for a game-high nine rebounds despite Texas’s huge size advantage. 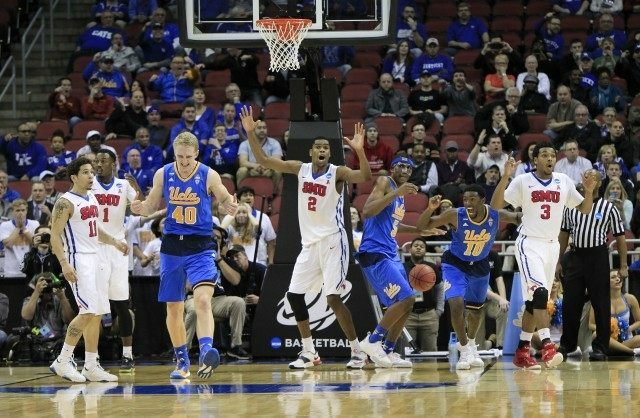 UCLA’s Kevin Looney was ranked as the top player on the court in UCLA’s upset of SMU, and he also had a game-high ten rebounds. The 10-seed Ohio State advanced with the 11th best player in the country, D’Angelo Russell lighting up VCU for 28 points in an overtime win. The only two games in which the best Value Add player on the court did not win were UAB’s upset of Iowa State, and Xavier’s win over Mississippi. In the latter game Matt Stainbrook (ranked 80th, 20 points on 8 of 10 shooting) was rated slightly below Mississippi’s Stefan Moody.